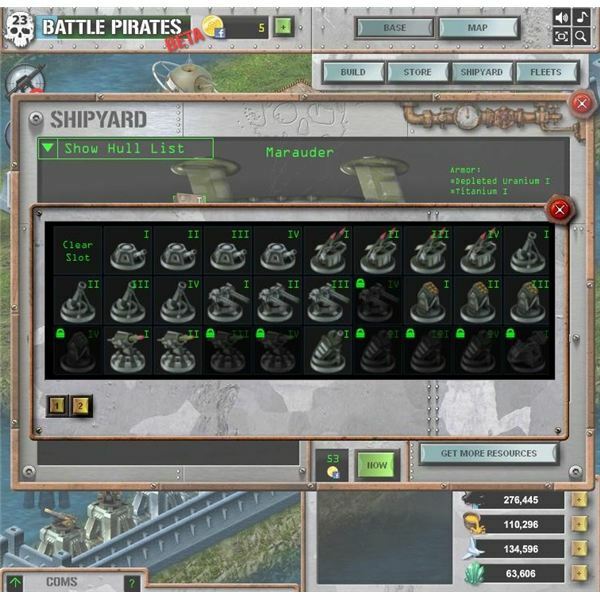 The core of good offense strategy in Battle Pirates, a Facebook MMORTS game by Kixeye, is all in how you design and use your fleets. The game gives you a wide range of choices in ship types, weapons, armor, and special mods – but then limits how much weight you can put on each ship, how much weight you can have in each fleet, the number of ships per fleet (five), and the number of total fleets. You also have a variety of target types, from Draconian-controlled salvage fleets and resource mines, to player-controlled fleets, to player bases (and eventually Draconian bases). Each of these calls for different offense tactics and therefore different combinations of ships and weapons. And finally, what you can do will depend on what you've actually researched and upgraded. 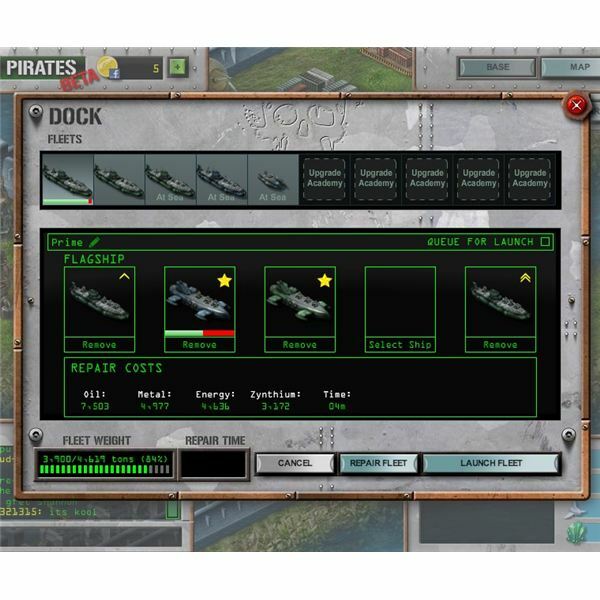 You may find guides for the absolute best ways to build a floating fortress using level 4 maelstrom rockets and depleted uranium – but if you're months of play away from being able to make them, it won't do you any good in the present. With all that said, here are some key tips to keep in mind. larger ships can hold more cargo. Once you've passed level 20 or so, the smallest ship you'll likely want to use in battle is the marauder. Everything smaller sinks too fast. Also, everything starts taking much longer to build and the question becomes: how many of what hulls can the next dock level support? If you start building the ships for the next fleet before the dock completes its upgrade, you'll be ready to launch by the time it's done. Next, choose each ship's weapons. These come in four categories: cannons, missiles, mortars, and rockets. They have different ranges, firing rates, accuracy, damage, and number of bullets per shot. They also have different weights, and the strategy is all in how you choose combinations of weapons and armor to fit into the weight allowed. In general, a ship is more effective when all of its weapons are the same type, or at least have similar range. But remember that you're not just choosing weapons for an individual ship, you're also choosing for the fleet that the ship is for. To have a wide variety of weaponry in the same fleet, put different kinds of weapons on different ships in the fleet. The key questions are: what is the purpose of the fleet, and what will each ship be doing? If you're planning to hit player bases, you're looking for range and damage over other considerations. Defensive turrets in bases are stationary with fixed ranges. 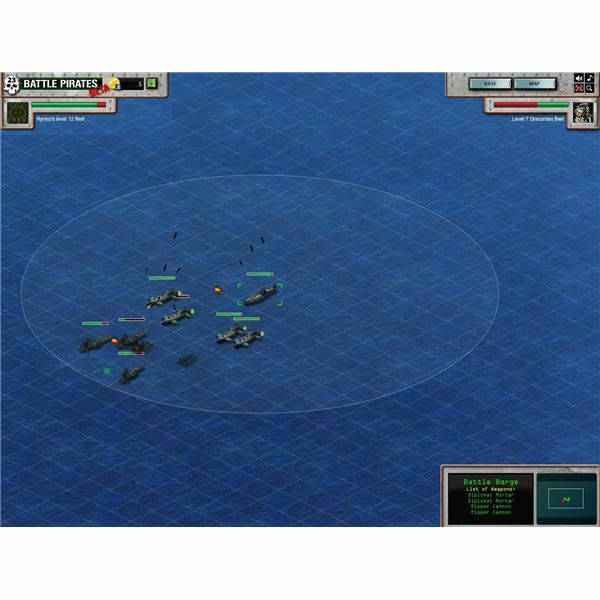 In general, you don't need to fire quickly while maneuvering, your targets are often well inland, you might be trying to avoid turrets, and you want each shot to make a dent because you only have five minutes per attack. Mortars (diplomats and peacemakers) are good choices (or were at the time of this article). They shoot slowly, but have a very long range and do a lot of damage per shot. Ideally you want all long-range weapons on all five ships, but then there's the problem of getting past any fleets defending the target base. To account for that, your best bet is to bring additional fleets that are designed for fleet-to-fleet battles, and to try to keep the base-attack fleet out of those battles. Failing that, it's good to have something short-range on hand, like rippers or hydras. To do well in battle against another fleet, shorter-range weapons are a must. Long range weapons have a minimum distance the ship must be before they can fire. In a fleet battle, if an opponent ship maneuvers too close to your long-range-only ship, you will not be able to hit it. Firing speed and/or number of bullets also become important. The faster you can sink an opponent ship, the less time they have to damage your ships. Each weapon comes with a rating for accuracy, but it's for hitting stationary targets. Weapons with 100% accuracy will precisely hit the spot where a ship was at the time the shot was fired – but if it has a slow fire rate, the bullet will trace a nice-looking arc through the air, very slowly, and not land until after a moving ship has passed the target spot. However, if another enemy ship is following the first one, that one will take those hits. Accuracy is not necessarily related to how effective the weapon will be in a fleet battle – key to fleet battle tactics is maneuvering your opponents into being where your bullets are going to land, regardless of what shot the bullets and what the initial targets were. Finally, for battles against high-level Draconian fleets (level 7 salvages and up, level 9 mines and up), ideally you want all short-range weapons, preferably on marauders or better. Their big ships are all long-range-only, so the key tactic is to get your ships right next to them without dying, at which point the Draconians are sitting ducks. 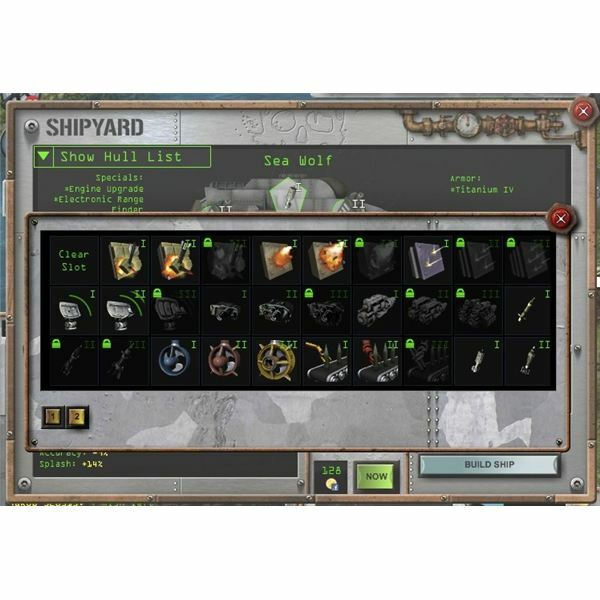 From longships up, there are slots available for special mods like improvements to specific weapons, improved armor against specific weapons, and improvements to ship movement and enemy evasion. These are researched in the Advanced Lab. By themselves, specials don't add to ship weight – a ship with specials but no weapons or armor will only have its base hull weight. Instead, specials add a percentage of additional weight to the ship's weapons and armor. For example, if the ship weapons add up to 1000 tons on their own, and a special adds 10% weight to weapons, the weapons will weigh 1100 tons with the special added. Once you've settled on weapons and specials, whatever weight is left over should be as filled with armor as possible. Short-range ships intended to take most of the enemy fire should have more armor than ships that will stay farther back. You might have to bump a weapon up or down a level to get the best combination for weight and ship health. 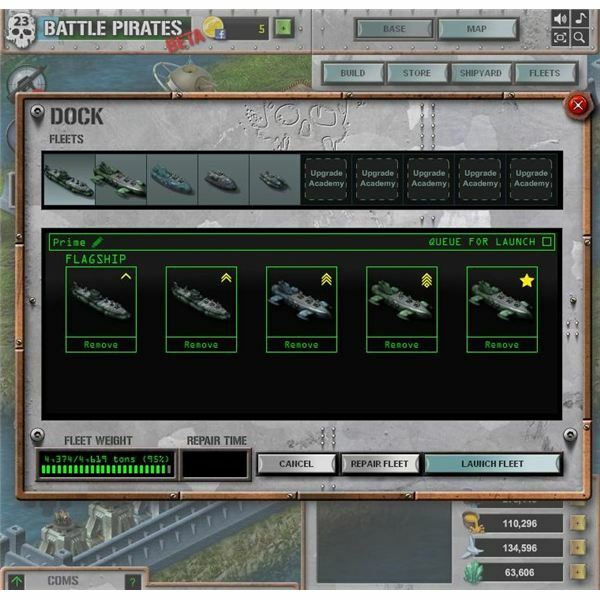 Each battle in Battle Pirates involves only two participants at a time, and can't be interrupted by other fleets. On the map, a battle in progress is highlighted in red. A player can be engaged in multiple battles at a time – one per fleet and also their base. To switch between different fleet battles, just click "Map" to get back to the map and pick another fleet tab. There is also base defense mode which can't be switched out once you're in. A fleet in motion can't be attacked. So, if you have a fleet specialized for hitting bases, a way to avoid fleet-to-fleet battles is to keep it moving at all times. Also, if your target base doesn't have any of its own fleets guarding it, you can avoid having to fight any fleets of his/her friends by clicking "attack base" from a long distance away. From the map, a fleet looks like a single ship, and the one ship is the flagship. 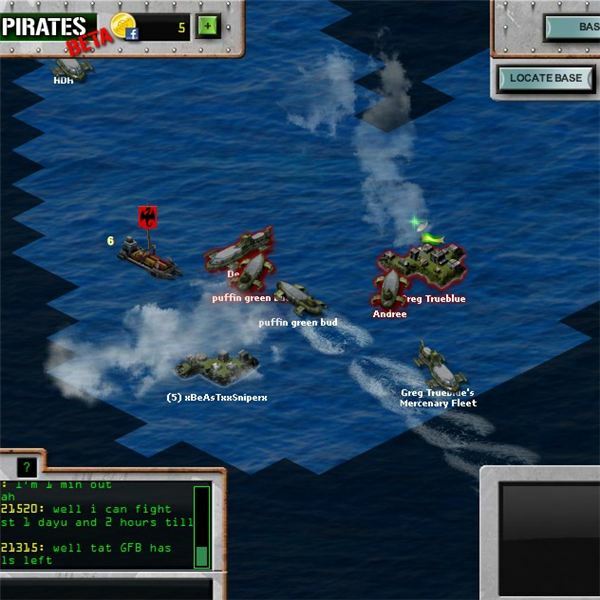 Some players enjoy surprising their enemies by putting a small ship as the flag in front of four much larger ships. This can work great to fool opponents into thinking the fleet is weaker than it is. However, you might end up having only four effective ships instead of five. There are limits to how many times you can hit a base, and how much total damage you can do, before a damage protection bubble goes up. This is not generally a problem if you plan to completely level a base in one attack. On the other hand, if you need more than one round, or you're aiming for specific buildings (resources, research buildings, dock, etc.) and need to scout the best direction first, or you're softening it up for a friend, or you're trying to give a friend a bubble with minimal damage, you have to pay more attention to attack counts and damage percentage. The starting point of each fleet comes from the direction of attack on the map. If you attack from the east (right), your opponent will be to your left. Each ship comes with circles showing the minimum and maximum ranges of its weapons, a green dot for where it's going, and a health bar if it has any damage. Each square on the blue screen is about 10 units of weapon range. By default, a ship stops moving when an opponent ship is in range of its longest-range weapon. 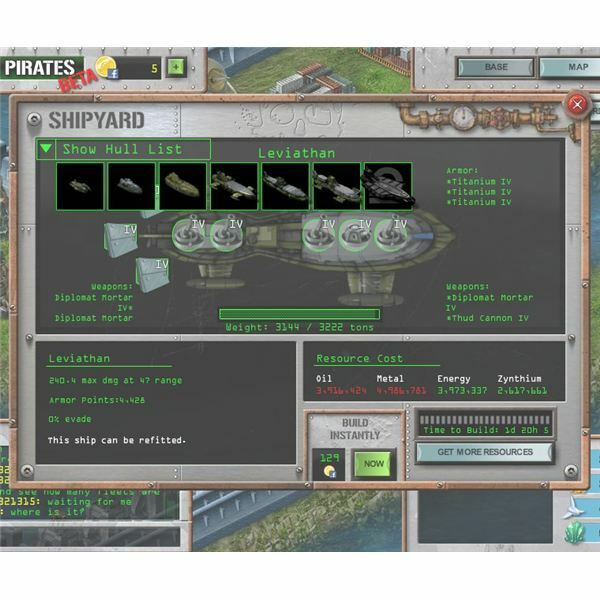 All ships in the fleet will target whichever opponent ship is closest (farthest forward) – generally the flagship if all else is equal, otherwise whichever ships have the shortest range weapons. The ships will stay lined up next to each other, making them vulnerable to splash damage from weapons that do splash. All Draconian fleets behave entirely in the default manner. In general, ship weapons do the most damage when hitting a target that is either stationary or moving directly toward them. Ships moving sideways are harder to hit, especially if they're smaller and faster. At the beginning of a fleet battle, you have a few seconds to change ship courses before the shooting starts. The base battle screen works the same way except there's a base instead of a blue screen with squares. By default, ships try to target turrets first. After a battle, your damaged fleets go back to your dock for repairs. For each fleet, there's information about how much it will cost in resources and how long it will take. If you just hit "repair fleet" you have to wait the entire time that it says. But there's a way to do it much faster – and the faster you can repair, the faster they're back on the high seas. First, you don't have to repair all five ships in a fleet at the same time – you can remove some and do them individually. In Kixeye games (both Backyard Monsters and Battle Pirates), you can buy the "Close Enough" speed-up for any base timer under five minutes for free. So, remove ships one at a time, starting with the most damaged, until the repair timer says "04 m" or less. It doesn't tell you the seconds, so "04" can mean anywhere from 04:00 to 04:59, but as soon as it starts, just hit "speed up" to buy "Close Enough." Then add back the other ships one at a time. If you're done playing for the night, you can repair all lightly damaged ships from all fleets in this way, then assign the heavily-damaged ships into a single fleet for overnight repair. Repair time is another consideration when designing your fleets. Since smaller ships are cheaper and faster to repair, one possible strategy is to set up a fleet where smaller, well-armored ships charge into the short range and take the brunt of enemy fire, while larger ships hang back and demolish from afar. Such a fleet works well against mid-level Draconians. Or try to have damage spread out over all the ships so that each individually will take less than 5 minutes to repair. Last but not least, the game limits the total number of ships you can have, whether in fleets or not. As you level up and build better ships, you'll naturally scrap the older ones you no longer need to make room. Most of your fleets will be designed for combat – but also keep at least one gunboat. These are useless in a serious fight, but gunboats are the best possible ship for map exploration because they travel fastest.